Community of Christ produces a special edition of the Hymns of the Saints hymnal, to commemorate the dedication of the temple. It’s bound in blue, rather than red, and has a large picture of the Temple in Independence within the first few pages. I’ve taken Ella and her older brother Lincoln to many temples: Kirtland, Nauvoo, Salt Lake, and Independence. And I’ve tried to teach them, at their level, that these are places where the Saints have sought to encounter God and a message of purpose of peace. Someday, I hope that they, too, will be able to rejoice in the temples throughout the Restoration as efforts by the Saints to capture a glimpse of what existence is and should be about. 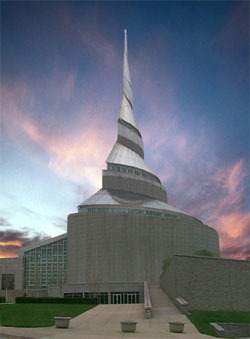 I hope that they will especially find the temples of Community of Christ meaningful to their lives and cosmosviews. In any event, last Sunday I wasn’t sure what the speaker was saying at the moment that Ella pointed to the picture of the Temple, but I was struck that my daughter was paying attention to my efforts to share with her something that has come to mean a great deal to me; but more importantly, struck that perhaps she had caught the power of that holy place, and that it had become something important in her life, too. It is this type of identity development which will be crucial in our effectiveness, as Community of Christ members, to pass on to the rising generation the message of peace and Zion that the Temple symbolizes. God’s efforts will not be frustrated, but ours likely will be if this sort of passing of the torch doesn’t take place. This entry was posted in Community of Christ, LDS, religious identity, Temples, Zion. I am very afraid the passing of the torch will not take place. The church out here in the hinterlands doesn’t have many children. Many of our young people are not to be found in church. I’m afraid our children didn’t insist they go and find the same experiences we found. It is hit and miss. I am profoundly grateful that all three of my adult children are active, but more importantly, have recognized the great cloud of witness and are each responding to it in their own particular ways. Most of the kids they grew up with in the church are more ambivalent, which is very sad. Not to be discourteous to the author of this, or any other blog-post, but is anyone else slowing the frequency by which they check this site? I mean, this is supposed to be “the” site for CofC issues, at least informally, and,..well, the posts are not only infrequent, but frequently uninteresting. Any discussion about 164? Anyone seeing repurcussions? What are the conversations like in your home congregation? What do we think about upcoming policy meetings by WCLC? Are the actions of leadership with respect to the “national conference” issues turning out as expected? What implications will this have on common consent going forward – or is this strictly a one-off activity to deal with homosexuality? What about the budget crisis? It just seems there are so many pressing issues in the lives of CofC and there are so many smart and educated and plugged-in bloggers on this site, it gets discouraging when we do happen to see a random post that it is about an anecdotal thought or veganism. Not to be discourteous to BTC, but I happen to think that identity formation is the most pressing issue faced by Community of Christ, whether the hook was anecdotal or not. Maybe you could have expanded on that thought. Myself and other young adults have now left the church because of 164. The disrespectful way the presidency dealt with their unilateral decision of not even considering the resolutions which had been worked on and had used due process was the last straw. We’ve waited long enough for listening and human rights. All they want is our money and now they are so lost in their own naval gazing they have actually said it publicly. You and the others now join a long list of malcontents in Restoration history. Where do you go from here? LDS Apostle Dallin H. Oaks referred to ex-members’ tendency to “leave the Church, but can’t leave it alone”. I have heard many times “I didn’t leave the church, the church left me”. Whatever your reason, I wish you the best. I am sorry, Susan. I appreciate the witness and stand you are taking. It is our loss. Tying this back to identity formation, I think in many ways the church has been unfaithful to the Church identity formed in Church Schools and camps the past 25 years. These generations have been given a vision and calling for justice in the example of Christ. When stalling, evasive language and limits to the power found in up or down voting is used by the leaders it “feels” unfaithful to Christ. When not tied to other processes for transforming our Community and making justice real, it is. I think the church leaders are genuinely working for justice and compassion for all, but it’s a rough journey with errors in judgment made along the way. We all learn together on the way. The competing urgency of declining funds and declining commitment adds to the distress. Finding understanding through Community discernment rather than the power of votes is a soul wrenching and vulnerable process. I think it’s the best way forward at this point, though. I have hope, but I know that many reasonable people think I’m drinking koolaid. maybe so. Membership retention is often a topic in the LDS General Conference talks. The advice given applies to our own families as well. Secular programs without any spiritual food will usually produce a shallow commitment. I’m speaking of keeping our youth active.